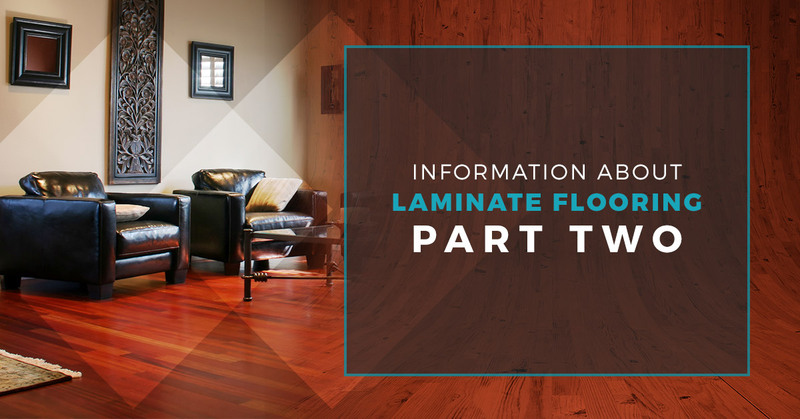 In Part One, we went over what laminate flooring is and why it’s beneficial to have in your home. If you’re just joining us, then we strongly recommend that you backtrack and read Part One, to know what the benefits may be for laminate flooring. In Part Two, we’ll cover the look and feel of laminate flooring, the rooms it will look best in, and the different types — which are many — of this type of flooring. In addition, we’ll also go over the care and maintenance for laminate flooring, so you know what you need to do to ensure it looks immaculate. For more information on laminate flooring, take the time to contact 2 Day Flooring. When you think of laminate floor planks, you might not think of beautiful, faux-wood flooring that ties the room together. A long time ago, laminate flooring was not known for its best attributes. Now, it’s considered to be a beneficial flooring option that’s durable, affordable, and as close to hardwood flooring without actually getting hardwood installed in your home. With so many options, it’s difficult to pick the right one for your home, which is why it’s essential that you talk to an expert before you make your final decision. The look and the feel of laminate flooring is essentially hardwood with more durable floor planks. Laminate flooring has that beautiful mahogany look without you needing to worry about scratch, stains, and spills. That beautiful look will be maintained and the feel of it is nothing less than hardwood, but in reality, it’s an affordable and durable option. The surface is realistic, the texture is similar to a hardwood, but the durability is anything but what you’d expect. If you love the look of hardwood floors, then laminate ones are a great option for those who don’t want to consistently clean all of the time. There are many different type of laminate flooring, so we’ll just be going over the basics. When you choose laminate flooring, you need to peruse between styles, designs, the look of material, texture, price, and even the installation process. When it comes to picking the laminate wood types, you can go lighter, darker, or somewhere in between. You also should consider if you want a smoother surface or another type of texture. Acacia, hickory, and cherry are all excellent options, but we also offer more exotic types. 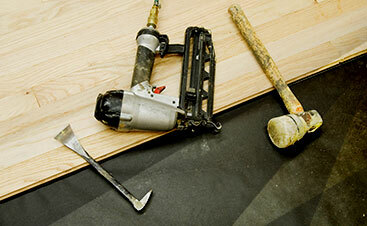 The best way to figure out the type of laminate flooring you want is to break it down by what’s most important to you. Are you considering the budget above everything else? The coloring or even the texture are the first and foremost options you want. If you have no idea where to start, then take the time to talk to one of our experts. We’ll gladly walk you through what you need to know to start this exciting journey into flooring. Before you decide on your laminate flooring, take a moment to figure out the room you want it in. Similar to hardwood flooring, laminate flooring looks great in dining rooms, hallways, entryways, living rooms, and the kitchen. Areas that you shouldn’t install laminate flooring in are generally areas that are exposed to a lot of water, unless they are manufactured accordingly. What’s neat about laminate flooring is that you can choose to have water resistant floor planks, so you can decide to put it in rooms such as the laundry area, bathroom, and other regions of your home that are heavy on water. 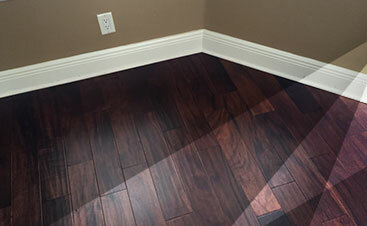 The care and the maintenance for laminate flooring is a lot simpler than hardwood. When you decide on your flooring, make sure that it’s either already created to be resistant to water or the type that’s not manufactured properly to be in heavily watered areas. This will help you know the best way to clean your flooring. There is a basic way to clean your flooring and there’s the method for when you have damage to your laminate flooring. While it’s difficult to damage laminate flooring, it is possible. To clean your floor planks, you’ll want to use a dust mop, a broom with soft bristles, or a vacuum cleaner. Unlike hardwood flooring, you can use damp cleaning products with microfiber mops to help get rid of any dirty areas. For preventative damage, make sure you clean with laminate flooring products and use clean cloths. For more information about preventive maintenance and laminate flooring, continue reading our blog. If you’re interested in laminate flooring, then don’t hesitate to contact 2 Day Flooring today.